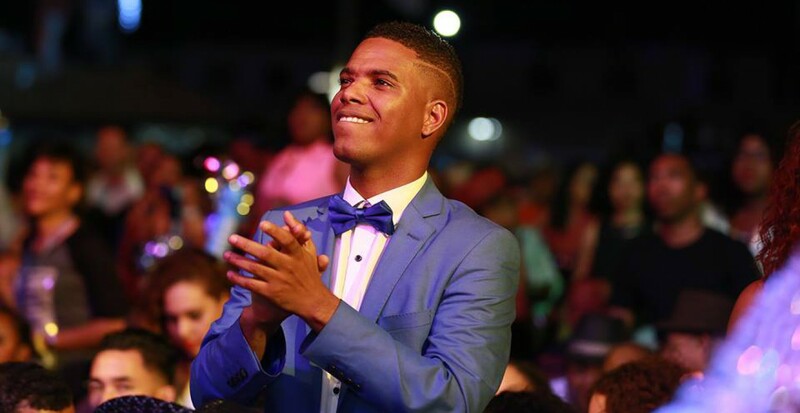 “Un Humilde Piedra” which means An Humble Stone is the title of the winning TUMBA song composed and sung by 2012 TUMBA KING Amos Balentin (the 42nd TUMBA WINNER) together with the best band of the carnival “tumba” season of the century ERA Outentiko. He participated already 4 times in the biggest national competition of TUMBA, and scored last time as second place with “Lei ta Lei”. Since then we knew he has all the capacities to serve as a future TUMBA KING. And it proved that 2012 is his year, with a special composition he wrote around 4/5 years ago and waiting for the right moment to polish and bring it to our nation. He brought a new hymn of patriotism and moralist thoughts to all of us. Currently, the Tumba Festival is a four-day musical event where the best local composers, singers, and bands compete to have their piece selected as the year’s official Carnival road march Tumba song. This isn’t just any festival. It’s a musical extravaganza! And winning means gaining prestige sought by the world’s most talented musicians. The winner becomes Rei di Tumba (King of Tumba) or Reina di Tumba (Tumba Queen). Mi por ta un djamanta i abo un rubi pa nos ta eksitoso Kòrsou mester ta uni. Ma subi un seru haltu pa buska inspirashon. Aya te den laira mas serka papa Dios. Pa mi wak mi isla fo’i otro bista. Y ma saka afó ta ki naturalesa ke siña nos. Si ami kubo uni nos lo forma un baranka. Lo no por tin nada ku por kibra nos. Un mensahe di konfiansa pa nos no pèrdè speransa. Un pueblo uni lo sa di vense tur maldat. Ku union nos lo hasi forsa. Dolo’i kabes nan di mi tera mi tin tur nami kurason. I abo pasado, bo’n pèrsigui nos mas. Di awe pa dilanti Di awe pa dilanti, dilanti nos ta bai. Mensahe di un humilde pieda. Ai rib’é seru ma mira kon bunita mi tera ta. A kue mi wowo kon kada pieda ta bria su so. Tin djamanta, rubi, esmeralda den un direkshon ku no ta kuadra. Mi kurason a hasi doló, konta ke union? Mester di hende pa pega pieda pa forma unio. He,ééé……..
Mester di pieda pa pega pieda pa bira e kos. Prens ku pancho a presentá. Huntu ku reina pa duna un man. Esta orguyoso mi ta di nan. Nos no ta pieda morto, nos ta pieda nan balioso. Ban legumai orguyo, paso nos mester di otro. Pega riba otro (koro kortiku). Sin dje nada no tin balor Bin aden, bin aden(koro kick). Bin aden, bin aden (koro kick). Tira un bista riba e fòrti. Do you visit here, sometimes? Hello Heliantha, thank you for your reply. Yes I do travel to the Netherlands (every year) since I studied there at Leiden but lived in Amsterdam. When will you be traveling to paradise? I advise you to come around Carnival – 2016 will be short but awesome! TUMBA is such a unique and diverse type of rhythm gives you all the chills and also makes you want to dance to it with no stop.